Definition at line 27 of file CLPolygon.h. Definition at line 23 of file CLPolygon.cpp. Definition at line 34 of file CLPolygon.cpp. Definition at line 86 of file CLPolygon.cpp. Adds a copy of the given line segment to the list of line segements. Definition at line 162 of file CLPolygon.cpp. Creates a new cubicbezier object and adds it to the list of elements. Creates a new cubicbezier object and adds it to the list of curve segments. Definition at line 135 of file CLPolygon.cpp. Creates a new point object and adds it to the list of elements. Creates a new point object and adds it to the list of curve segments. Definition at line 125 of file CLPolygon.cpp. Returns a pointer to the point with with the given index or NULL if the index is invalid. Returns a pointer to the line segement with with the given index or NULL if the index is invalid. Definition at line 145 of file CLPolygon.cpp. Returns const a pointer to the line segement with with the given index or NULL if the index is invalid. Definition at line 154 of file CLPolygon.cpp. Definition at line 191 of file CLPolygon.cpp. Definition at line 108 of file CLPolygon.cpp. Referenced by getPath(), CCopasiXML::savePolygonElement(), and CCopasiXMLParser::PolygonElement::start(). Definition at line 116 of file CLPolygon.cpp. Returns the number of line segments. 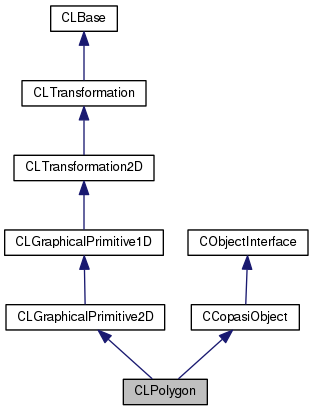 Definition at line 100 of file CLPolygon.cpp. Definition at line 177 of file CLPolygon.cpp. Definition at line 199 of file CLPolygon.cpp. Definition at line 39 of file CLPolygon.h. Referenced by CLPolygon(), getKey(), and ~CLPolygon(). Definition at line 34 of file CLPolygon.h. Referenced by addElement(), CLPolygon(), createCubicBezier(), createPoint(), getElement(), getListOfElements(), getNumElements(), removeElement(), toSBML(), and ~CLPolygon().